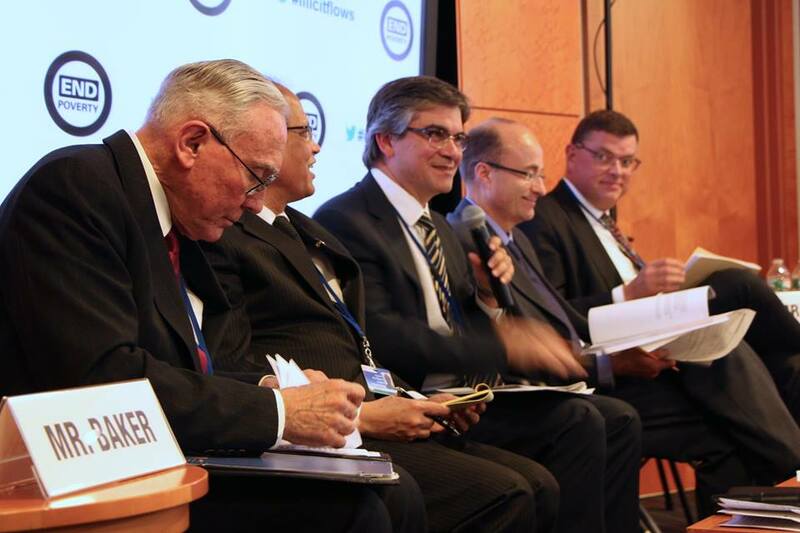 Managing Director Tom Cardamone was the moderator for the “Securing a Place for Tax Justice and Transparency on the Post-2015 Development Agenda” panel and a panelist on the “Civil Society Perspectives on the Outlook for Change” panel. During the conference, the first annual Amartya Sen Prize was awarded to Max Everest-Phillips, Hamish Russell, and Gillian Brock for their essays on illicit financial flows, poverty, and inequality. Established in 2014 by ASAP, GFI, and Yale University’s Global Justice Program, the annual prize is named in honor of Amartya Sen, the Nobel-winning economist whose work has shown how the rigor of economic thinking can be brought to bear on normative and practical questions of great human significance. The 2014 Amartya Sen Prize Contest solicited original essays on how illicit financial flows relate to global poverty and inequality. Mr. Everest-Phillips wrote his essay on tackling illicit financial flows in developing countries over the long term, while Mr. Russell and Dr. Brock co-wrote their essay on the moral responsibilities of tax professionals. The study reveals that illicit financial flows hit an historic high of US$991.2 billion in 2012—marking a dramatic increase from 2003, when illicit outflows totaled a mere US$297.4 billion. Over the span of the decade, the report finds that illicit financial flows are growing at an inflation-adjusted average rate of 9.4 percent per year. Raymond Baker travelled to Dubai in November to take part in the World Economic Forum’s Summit on the Global Agenda 2014. As a member of the Global Agenda Council on Transparency and Anti-Corruption, Raymond participated in meetings along with fellow Council members from organizations such as Transparency International, the World Bank, APCO Worldwide, and the OECD, as well as members from India, Myanmar, China, Pakistan, Panama, and many more countries. 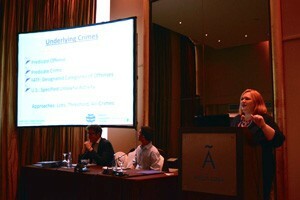 Raymond is also a member of the Meta-Council on the Illicit Economy 2014-2016, and he participated in sessions with members representing organizations including the Institute for Security Studies in South Africa, the World Customs Organization, the Organization of American States, and TRAFFIC International. 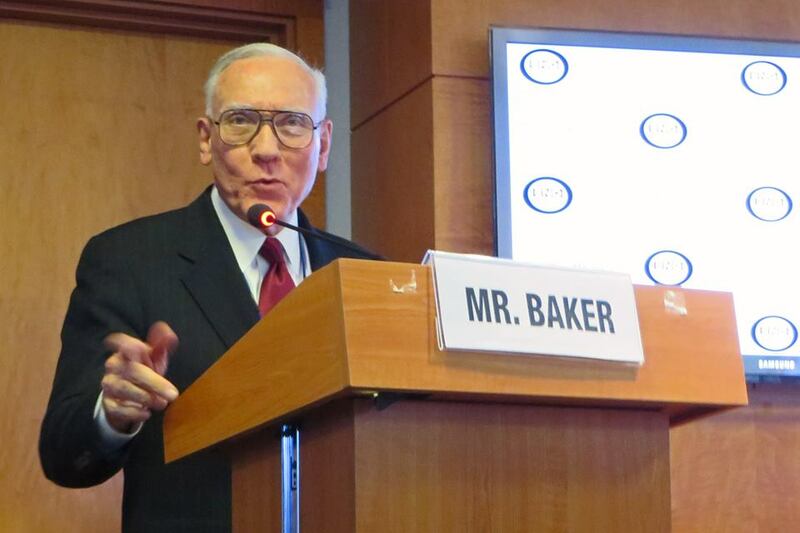 In early December, Raymond Baker was invited to speak at conference in Johannesburg, titled Organized Crime in Africa. The event was hosted by the Global Initiative Against Transnational Organized Crime and included participants from the African Center for Open Governance, the International Crisis Group’s Central Africa project, and academics and journalists from countries such as Mali, Angola, Uganda, Nigeria, and South Africa. Recently, Tom Cardamone attended the OECD’s 8th Meeting of the National Focal Points for Policy Coherence for Development, which was held from December 17-18 in Paris. The meeting sought to advance the dialogue on assessing policy coherence for sustainable development in the Post-2015 Agenda. Tom was invited to speak at a session titled Shaping Universal, Measurable, and Achievable Targets for Reducing Illicit Financial Flows in the Post-2015 Agenda along with other high profile individuals such as William Danvers, OECD Deputy-Secretary-General, Erik Solheim, Chair of the OECD Development Assistance Committee, and Phil Mason, Head of the Anti-Corruption Team at DfID. Nelson Barbosa – Dr. Barbosa will be joining GFI’s Advisory Board. He is the incoming Planning Minister in Brazilian President Dilma Rousseff’s new government, having formerly held the post of Brazil’s Deputy Finance Minister from 2011 to 2013. He previously served as Secretary of Economic Policy (2009-2010), Secretary of Economic Monitoring (2007-2008), and earlier as an analyst at the Brazilian Central Bank. Huguette Labelle – Dr. Labelle will be joining GFI’s Board of Directors. She served as the Chair of the Board of Directors of Transparency International (TI) from 2005 to 2014, and is the former Chair of the Canadian International Development Agency (1993-1999). In addition, she served as the Chancellor of the University of Ottawa for almost twenty years (1994-2012). In October, GFI Legal Counsel and Director of Government Affairs Heather Lowe, GFI Communications Director Clark Gascoigne, and Tom Cardamone traveled to Lima, Peru for the 2014 annual conference of the Financial Transparency Coalition (FTC). Clark made a presentation to journalists about illicit financial flows in a workshop proceeding the conference, while Heather spoke on panels about money laundering and beneficial ownership transparency. Heather was honored to be elected vice chair of the FTC’s Coordinating Committee for this year. She will serve alongside Alvin Mosioma of Tax Justice Network-Africa, who was elected to be the FTC’s new chair. Heather Lowe also attended the UN Forum on Business and Human Rights from December 1 to 3 in Geneva. Heather was invited to be a member of a panel organized by the International Corporate Accountability Roundtable (ICAR) and the Danish Institute for Human Rights. The panel discussed the National Action Plans that countries have been challenged to develop in order to implement the UN Guiding Principles on Business and Human Rights. In early December, Tom Cardamone and the Executive Director of Jubilee USA, Eric LeCompte, traveled to Geneva to meet with officials at the Africa Progress Panel, the South Centre and with Vatican representative Archbishop Silvano Maria Tomasi to discuss the upcoming Financing for Development (FfD) Conference and the UN Sustainable Development Goals (SDG) process. Specifically, GFI and Jubilee are promoting language that aims to curtail 50 percent of illicit financial flows related to trade misinvoicing by 2030. Trade misinvoicing is the process used to move up to 80 percent of all illicit funds out of developing and emerging market countries. 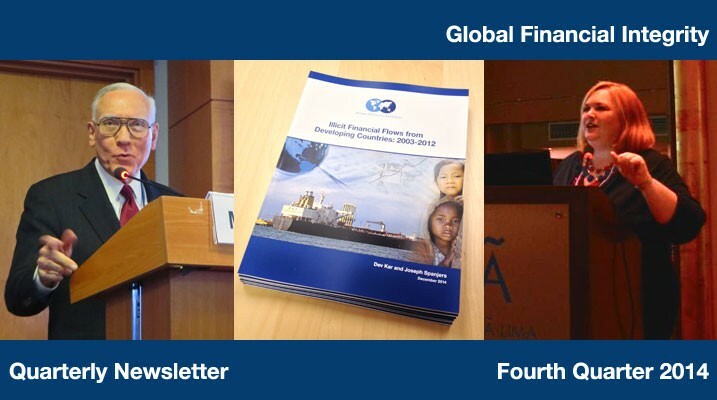 Further engagement with these three institutions on the FfD and SDG processes will take place throughout 2015. 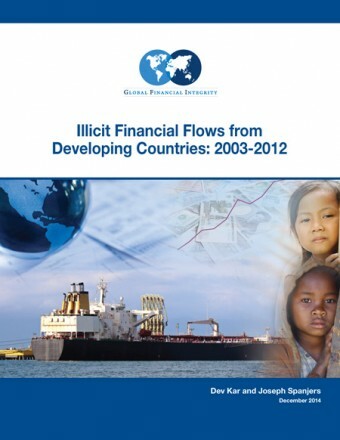 The report Illicit Financial Flows from Developing Countries: 2003-2012 found that the US$991.2 billion that flowed illicitly out of developing countries in 2012 was greater than the combined total of foreign direct investment (FDI) and net official development assistance (ODA), which these economies received that year. Illicit outflows were roughly 1.3 times the US$789.4 billion in total FDI, and they were 11.1 times the US$89.7 billion in ODA that these economies received in 2012. Sign up here and select “Quarterly Newsletter” to receive an email version of this newsletter each quarter. Global Financial Integrity would like to wish everyone a wonderful holiday season.